Summary: Riley Witt is running out of time. Battling Alzheimer’s disease, Riley’s grandmother Mary suffers from memory loss, mood swings, and a tendency to wander off. As senior year approaches, Riley has to face the reality that the one person she depends on most is slowly fading. Making matters worse, when Mary does remember the past, she tells tales of time travel and visions. As Mary’s version of the past gets more confused, Riley knows they are running out of time together. But when Riley discovers a guitar belonging to a famous rock star at Mary’s house, the truth behind the crazy tales finally comes out. 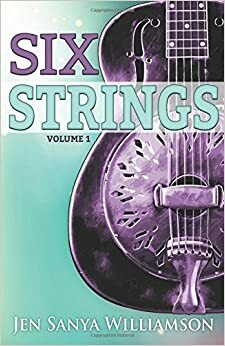 SIX STRINGS tells the story of Riley’s journey back to 1973 where she enters a world of music, long-lost family, and first love. Her adventure is all about discovering her past, understanding her present, and figuring out how to step into her future. If it hadn’t been brought to my attention, I probably would’ve never found this book. Before I read it, I hadn’t heard much about it, but the premise still intrigued me. Time travel stories can be really good! The book follows Riley, a rising senior who has to deal with her grandmother’s advancing Alzheimer’s. But in her moments of lucidity, she tells Riley about time travel. It’s her figuring all this new information out and discovering secrets and battling demons, all while still managing to fit a little lovin’ in the process. This is one of those fast reads that you can fly through and that leave you feeling nice and warm inside. Since this is volume one, I’m sure that the upcoming volumes will be just as promising. If you’re looking for a different but still feel-good contemporary, you should check this out! Just when Eve thinks she will die―not from her injuries, but from boredom—her mother gives her a special project: Create the perfect boy. This book was great. It follows the two voices of Evening and Solo, two unlikely partners who end up discovering more about their reality than they ever thought possible. I really liked this book because it blended together contemporary and sci-fi in a really nice way. And although the plot is interesting enough, it’s the characters that truly make this book what it is. Eve and Solo are witty, funny, and enjoyable. Their voices are friendly and snarky in a really good way—the kind of way that just keeps you wanting to read more about them. This book never reached a slow point, at least not for me, as I read it in one sitting (it’s only 290 pages, after all). If you’re looking for a quick, fast-paced read, I would totally recommend this. I’d been hearing a lot of hype surrounding this book for a really long time, and it was just a matter of when I was going to give in and buy it. Thankfully, I bought it off bookoutlet and though it took me some time to get to it…it was totally worth it. This book follows Alina Starkov, a girl by any means ordinary, who lives in the war-stricken country of Ravka, which is divided into two by a slice of darkness where feral creatures lurk called the Shadow Fold. Alina is then trained to become a Grisha, and she soon discovers that not everything is what it seems. This was fantastic. The world-building was excellent, the characters were great, and the plot was amazing. But for the first half of the book, we trudge on as the action rarely picks up. It was mostly an information dump about the world, and how Alina struggles to fit in it. However, as the second half of the book progresses, the action gets more and more intense until it comes to an incredible head. Overall, I think this is a really, really great series and I look forward to continue on with Siege and Storm very soon. Summary: To save her mother’s life, Clary must travel to the City of Glass, the ancestral home of the Shadowhunters—never mind that entering the city without permission is against the Law, and breaking the Law could mean death. To make things worse, she learns that Jace does not want her there, and Simon has been thrown in prison by the Shadowhunters, who are deeply suspicious of a vampire who can withstand sunlight. In the third installment of TMI, everyone travels to Idris, the home of the Shadowhunters. Jace repeatedly tries to convince Clary to stay away from Alicante, the Glass City, and to stay behind in New York. But, as our favorite infuriatingly stubborn heroine would have it, she doesn’t listen to Jace and goes to Alicante anyway. An incredibly complex web of events creates chaos, and now it’s up to the Shadowhunters and Downworlders to band together against Valentine. I knew going into this series that this was the original end to TMI. Cassandra Clare then decided to add three more installments to the series—a second trilogy, if you will—which became City of Fallen Angels, City of Lost Souls, and City of Heavenly Fire. Before I continue on with the second trilogy, I am interested in giving The Infernal Devices a shot first. Truth be told, this is a painstakingly long series, 9 books in total if you count TID, all over 500 pages each. I always need to take a break in between books, just so I can go into the story feeling like it’s a fresh start. Because, if I’m speaking honestly, I always need to take a little break from these characters. The story in City of Glass is nothing short of compelling—I did read this in two days. It was engaging, frustrating, exciting, and a whole range of things more at the same time. The cast was as lovely as usual; my love for Isabelle, Alec, and Magnus continues only to grow and never dwindles. Clary, was, as usual, difficult, and so was Jace, though I observe he’s a bit more tolerable in this book. Simon is learning to be his own self and I love it, which is a giant leap from the scared puppy he was in City of Bones. I feel that the only thing lacking in this first TMI trilogy is a solid villain. Valentine is the central villain through all three books, but he was…bland to me. Every villain in every book has delusions of grandeur and perpetually calm dispositions. But I wish the villain in this trilogy would’ve had dimension, something to make him human. We learn absolutely nothing about his past—what made him the way he was, why he did the things he did, or hell, why he wanted what he wanted. We didn’t have insight, which is my one major flaw of this trilogy. Overall though, I did enjoy it immensely and look forward to continue on with the series. Summary: Clary Fray just wishes that her life would go back to normal. But what's normal when you're a demon-slaying Shadowhunter, your mother is in a magically induced coma, and you can suddenly see Downworlders like werewolves, vampires, and faeries? If Clary left the world of the Shadowhunters behind, it would mean more time with her best friend, Simon, who's becoming more than a friend. But the Shadowhunting world isn't ready to let her go—especially her handsome, infuriating, newfound brother, Jace. And Clary's only chance to help her mother is to track down rogue Shadowhunter Valentine, who is probably insane, certainly evil—and also her father. In my venture to plow through The Mortal Instruments, I continued with the second book in the six-part series. In this installment, the cast is dealing with the aftermath of finding out that Valentine is not only Clary’s father, but also Jace’s. In an effort to shove her feelings for Jace down as much as she can, Clary attempts having a romantic relationship with Simon, which, in my opinion, backfires immensely. Their relationship was awkward and unsure, like they were stumbling through the motions. In short, Clary and Jace are trying to deal with the fact that they can’t have feelings for each other—no matter what. I’ve always struggled with Clary as a protagonist—she’s impulsive and, quite frankly, blindly irrational sometimes. She makes decisions without any forethought or afterthought, for that matter, and as much as the reader knows that she loves Jace, Simon, etc., it’s hard to ignore the fact that sometimes this same love drives her to choices that potentially puts those same people in jeopardy, as ironic as that is. Something I didn’t quite understand the purpose of in this book was Simon becoming a vampire. I think it was a completely unnecessary plot device. In the grand scheme of things, what could have been Cassandra Clare’s intention with this? Officially make him part of the Shadow world? Was that it? I’m not sure, but I hope I find out more as the series progresses. I think I speak for most people that have read this particular book that the tension between Clary and Jace is somewhat disturbing. This is addressed by them several times throughout the story, but not once did it ever make me not cringe. As much as I have pointed out this book’s misgivings, I did enjoy it. I find that this series is just fun to read, it’s action-packed and witty, so you’re never bored for long stretches of time.